BeenThere-DoneThat: The Barbican area (7), London. 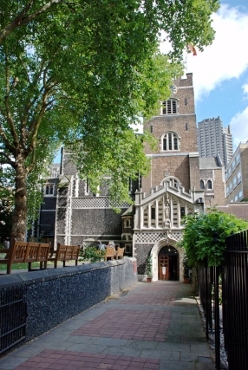 A very short distance south-east of Smithfield Market is the 12th century (Norman) priory church of St. Bartholemew the Great which has appeared in a number of films and television programmes. It is open to the public but they do make a charge for visitors to look around. 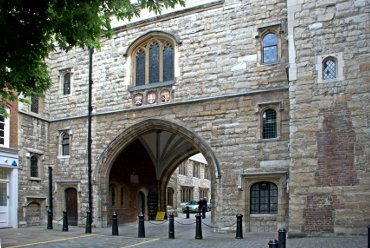 A little north of Smithfield Market along St. Johns Lane (Not St. Johns Street) is St. Johns Gate built in 1504 as the south entrance to the inner precinct of the Priory of the Knights of Saint John - the Knights Hospitallers. It is now a small museum open to the public free of charge but, at the time of writing, not open on a Sunday. 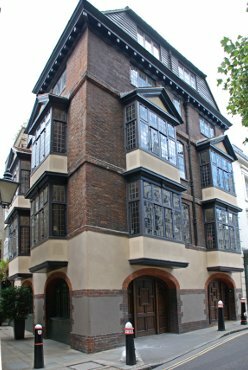 Two townhouses in Cloth Fair which have been described as Tudor or Elizabethan and built between 1597 and 1614. However it appears that their age is uncertain although, apparently, the windows have been authenticated as Tudor. It is suggested, however, that these windows have been used in a later building which may date from the 1700s. Cloth Fair is a narrow street which joins Little Britain at its northern end. 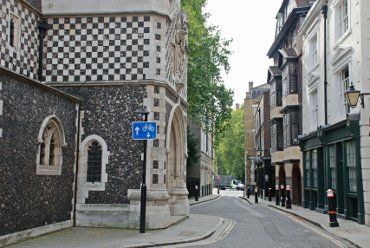 On the left is part of the church of St. Bartholomew the Great with some very nice flushwork (the chequered pattern) around the entrance porch. This entrance is not accessible to the public. The public entrance is in Little Britain. Further along on the right are the two Tudor townhouses shown in the previous picture and the street at the far end is Little Britain.